Teams prepare for cricket in different ways, and after a century and a half of battle, there can’t be many pre-tour activities still untried by the old Ashes adversaries. Few have proven so inspiring as the pilgrimage to Gallipoli taken by Steve Waugh’s 2001 Invincibles, and not many can have gone as badly – nor presaged an Ashes series as accurately – as the England team’s 2006 spy mission in Staffordshire (Ali Martin wrote about this and other training camps here). It’s generally felt, though, that the best way to warm up is by playing cricket. Or at least, it used to be. England used to take great pains over rehearsing their understudies. It was vital, the thinking once went, that they should learn to play first class cricket on foreign pitches. Take, for example, the England A tour of Australia in early 1993. Ten games were played, including first class fixtures against all of the Sheffield Shield teams except Victoria (who were incidentally the weakest team in Australia that season). During the course of those fixtures, England’s young guns came up against Ponting, Gilchrist, McGrath, Hayden, Slater, Blewett, Bevan, Law, Kasprowicz, Greg and Chris Matthews, Cox, McIntyre, Wellham, Rackemann and Sleep plus future England coaches Troy Cooley and Trevor Bayliss. That certainly makes an interesting contrast with the team’s most recent Antipodean tour, during which the England Lions played one non-first class game featuring two international players (Cutting and Forrest) followed by one T20 game featuring none at all. They then, of course, travelled to the West Indies and were completely taken apart. When other national teams visited England, the old days were almost unrecognisable. 25 years ago, the Australians came to the British Isles in possession of the Ashes. Their 1993 tour lasted 112 days and cricket was scheduled on 82 of those. The 30 matches comprised six tests, three ODIs, 16 matches against all of the counties except Nottinghamshire and Yorkshire, plus exhibition games against the Duchess of Norfolk’s XI, the England Amateur XI, the Combined Universities, the Minor Counties and Ireland. The tour was a riotous success for the visitors (see their tour statistics here). They won 18 matches, drew nine and lost only three. That they did this with a squad of 17 players made their performances all the more remarkable. During the county games alone, they played against no fewer than 76 international players. No county put out fewer than two internationals against them; Essex fielded eight and Lancashire fielded seven. The county matches against the tourists were important occasions, not just for the practising visitors but for the home board and the first class teams. It was almost unthinkable for a county not to play the tourists, and it was equally rare for the county not to put its marquee players on show. Nothing, however, has changed as much as the way the England team prepares for overseas tours. 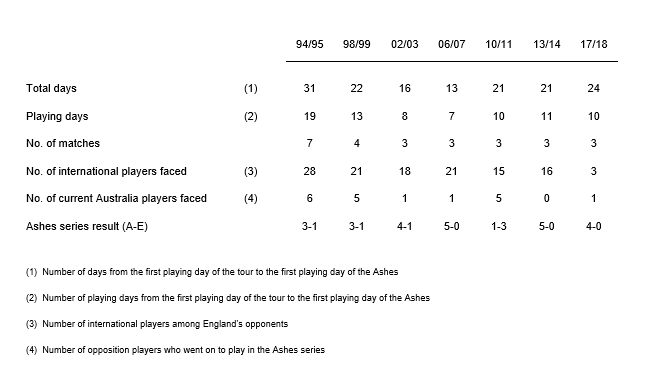 Let’s go back 25 years again: during the Ashes tour of 1994/95, the England team arrived 31 days ahead of the first test and played on 19 of them, engaging in seven matches during which they faced 28 international players. Eight of these players (Bevan, Blewett, McIntyre, Slater, Taylor and Mark Waugh) would go on to feature in the test series. Even after the main event had begun, three more four-day games were slotted between the test matches, which not only gave England time to assess their rapidly-dwindling options as injuries ravaged their squad, but also gave Australia the opportunity to field a further 11 of their players. This was not only how it was a quarter of a century ago; this was how it had always been. It was the pattern for the next few tours, too, but other traits of the warm-up schedule were about to evolve very quickly. My table below shows two pertinent trends: one is a marked diminution of the preparation period, from 31 days in 1994 to 22 in 1998, 16 in 2002 and 13 in 2006; the other is that the number of Australian international players during England’s warm-up matches was stable (relative to the number of these matches) until 2010, whereupon it suddenly and steeply declined. It was England who learned their lesson first, and they did so during the 2006/07 series. Having steadily cut their acclimatisation period down to less than a fortnight – half the duration, and half the number of playing days, of the 1994/95 series – England collapsed to their first Ashes whitewash since 1920/21. The ECB had whittled away, year by year. The stick had broken. The penny dropped. The error was rectified in the 2010/11 season, with a full extra week restored to the warm-up schedule, and England bounced back. They had found, through trial and error, that a warm-up period of less than three weeks weakened their team. Next came Australia’s lesson. Until November 2010, they had always put out strong teams to practise against England, but that all changed after one match. The match in question was Australia A v England at Hobart – the last warm up match before the first test – and the home XI is worth listing in full: Hughes, Cowan, Khawaja, Ferguson, White (c), Paine (w), Smith, O’Keefe, McKay, George, Cameron. Ten of those players wore the Baggy Green; three would wear it in the coming series. It was an impressive show of squad depth by the hosts – but they had shown England too much. Only a final-wicket stand prevented England from winning by an innings; they still won by 10 wickets. Australia had overshared. They learned their lesson. That match, seven years ago, was the last time that Cricket Australia selected a current Australian test player to face England in a practice match. In 2013/14, England faced 16 players with Australian honours, but the home board was careful to make sure that during the visitors’ four non-international matches, they had no exposure to any of the current test team. It was an expedient made even more simple on the recent 2017/18 tour: England again played only four practice matches, during which Cricket Australia fielded only one player with test cricket experience. That was Tim Paine, who had by that point appeared in four tests, the last of which was seven years previously. And whereas in 2010/11, England’s warm-up opposition had become steadily stronger, culminating in that impressive Australia A team, this time the home selectors reversed the trend. For the last match before the 2017 Brisbane test, Paine was omitted and the most senior player was Gurinder Sandhu (two ODIs in 2015). It’s not just the England team that suffers; of course it isn’t. Let’s go back to that apparently endless summer of 1993. That spring, a squad from Zimbabwe had been invited to tour England by way of welcoming them into the fold as a test nation. They had, by this point, played four test matches, three at home and a thrashing in Delhi. The rationale went: why not give them more of an opportunity to get used to playing multi-day matches against professional cricketers in unfamiliar conditions? They were given six matches, including four against counties at full strength. During this brief and friendly ‘work experience’ tour, they came up against 14 England internationals: Brown, Butcher, Croft, Ealham, Fleming, Giles, Headley, Hollioake, James, Maynard, Morris, Patel, Thorpe and Watkin. In addition, they also faced Angel, Blewett, Jones, Sleep and Zoehrer of Australia; Morrison of New Zealand; Mudassar Nazar of Pakistan; Arthurton, Harper, Lambert and Simmons of the West Indies. What a wonderful introduction to overseas touring that must have been. Last year, the game’s global custodians extended the same invitation to Afghanistan. Their reward? One unofficial limited-overs game against the MCC at Lord’s. The MCC did their bit: they fielded a strong team, they streamed the match around the world and 1.2 million people tuned in to watch. I even had the great privilege of commentating on the game. But that was all Afghanistan got. It’s a pity that in terms of quantity and quality of preparation, the international teams of today are so inferior to teams of the past. It denies the public opportunities to visit cricket grounds and see the best players in the world at affordable prices. It reduces the incomes of professional clubs. It erodes people’s access to the game. When tourists don’t tour, they don’t learn.